Pluto tracking across the night sky, May 8-20, 1997. The superimposed red points show the moving point that the JCMT measured for the dwarf planet and its moons during this time. Scientists are attempting to map Pluto's icy depths using old telescope data before a NASA spacecraft reaches the distant dwarf planet in 2015. The researchers say they found hints of frozen chemicals hidden beneath Pluto's crust in data obtained by the James Clerk Maxwell Telescope (JCMT) on Hawaii in the late 1990s. 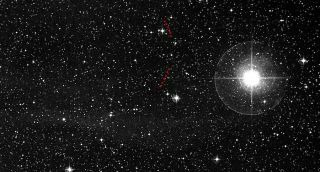 Pluto, which was only discovered in 1930, orbits between 2.7 billion and 4.5 billion miles (4.4 billion and 7.3 billion kilometers) from the sun. For comparison, Earth orbits 93 million, or 150 km, from our star. Powerful observatories, such as the Hubble Space Telescope, have taken detailed images and maps of Pluto in recent years, even discovering new moons around the dwarf planet. Nonetheless, Pluto has remained quite mysterious because it is so far away. Earthlings will finally get a detailed look at part of the frigid body next year when NASA's New Horizons spacecraft flies by Pluto. The probe left Earth in 2006, the same year Pluto was dethroned from its position as our solar system's ninth planet. New Horizons will be just the fifth spacecraft to travel so far away from home, behind Pioneer 10, Pioneer 11, Voyager 1 and Voyager 2. In anticipation of this historic mission, Greaves and her undergraduate student Ailsa Whitelaw said they looked at old data from JCMT's SCUBA (Submillimeter Common-User Bolometer Array), two instruments which scanned the cosmos in the submillimeter range of the electromagnetic spectrum — wavelengths between far-infrared and microwave. The researchers found evidence of invisible 0.85 mm waves emitted from beneath the surface of Pluto, which they believe could be linked to a possible dry layer of frozen nitrogen and methane hidden under a dark surface patch of water ice and frozen polymers. "I'm really excited to see what New Horizons will find a year from now," Greaves said in a statement. "Some researchers think that even deeper down, Pluto has liquid water, kept fluid by remnant heat from a big crash that formed its moons — if so the surface will probably look wrinkled. But the flyby is so quick that we'll need to follow up — maybe with future radar we can dig down even further." Greaves will present her findings at the National Astronomy Meeting in Portsmouth, England this week.